Photoshop is one of the most popular photo editing and development software packages available online. Why is it so popular among people? Why everyone wants to learn it? First, Photoshop is much more than software; it is a way to express yourselves and create something that never existed. It takes several months to master Photoshop and create something worth watching. The best thing about Photoshop is that you can create what you want and when you want. Moreover, if you are a website owner, you don’t have to spend time or money in getting new business cards or images for your website. There are thousands of jobs available online and offline for Photoshop professionals. Almost every studio requires people who can work around Photoshop and create amazing images. Further, most of the website owners need photo editing work every now or then. Most of the website companies, marketing agencies, and even media channels require trained Photoshop professionals. This is one of most powerful tools ever created by Adobe and many inspiring books have been written by expert authors around the world. We have already posted the highly recommended books on Photoshop, however, this article is focused on all FREE resources. Happy learning. If you are planning to learn Photoshop, here are some basic tutorials to start and improve your photo-editing skills. These tutorials will help you start from scratch and move up to the expert level. Photoshop 123 - A Photoshop tutorials website. Supa Dupa Web Design A blog about web development and related things. You will find some good photoshop tutorials on this blog. Video tutorials are an amazing way to learn Photoshop and you can watch every single step and create a sample project accordingly. It will allow you to understand features that are often skipped in text tutorials. Official Adobe Photoshop Tutorials Official Photoshop video tutorials from Adobe, the creators of Photoshop tool. 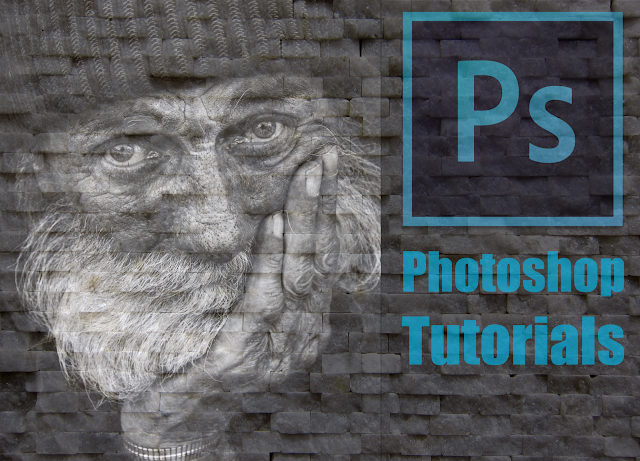 PhotoShop Beginners Tutorial A Photoshop tutorials playlist focused for beginners. How To Get Started With Photoshop - 10 Things Beginner Want to know Simple tips for beginners. Tutorial Tuesday Photoshop Tutorials - 190+ Tutorials Youtube Playlist on Photoshop. Photoshop Tutorials 30+ Short Tutorials Playlist By Terry White. Photoshop Tutorials by newboston newboston is a popular channel on Youtube for tutorials. This playlist contains exclusive Photoshop tutorials. Photoshop Video Tutorials Yet another playlist on Youtube for photoshop tutorials. Remodeling a Figure in Photoshop Simple tutorial to demonstrate how you can remodel a figure using Photoshop tricks. Photoshop tutorials Playlists by TutorVid.com TutorVid.com is a dedicated website for video tutorials. There are many playlists on the Youtube channel of TutorVid. Photoshop: How to Transform PHOTOS into Pencil Drawings Another photoshop trick tutorial to demonstrate how you can convert a simple picture into pencil drawing look and feel. Photoshop video tutorials Playlist with 35+ short videos These are short video tutorials with simple photoshop tips. How to lose weight in photoshop Another photoshop trick tutorial to demonstrate how you can look slim in a picture. A Playlist of Photoshop techniques for lightning effects This playlist focuses on tricks for lightning effects. Photoshop Tutorial: Creating Logos This tutorial teaches how we can create a logo using photoshop. Photoshop tutorials by Marcin Mikus with 80+ videos. Free Courses at Udemy for Photoshop Udemy is a popular marketplace for teachers and students. Experts from across the world teach various skills on this website. You can find many Photoshop tutorials on this site for cheap price and at times Free as well. Learning from eBooks is the latest trend, especially with interactive index and ability to add notes. You can carry eBooks everywhere and you can even gain knowledge in your spare time. PDFs have a thorough explanation of the features and the best examples to understand them. Photoshop Shortcuts in a PDF format: Best Free Cheatsheet One of the best ways to learn is to have a cheat sheet that can inform you about all the available features of Photoshop and you can implement them right away without looking after every single shortcut. Official Photoshop Reference Book This is the official Photoshop reference book by Adobe. Web forums are best because of the help that you can get online. Photoshop is difficult to learn, especially when you move past the initial features and that’s where an online forum can offer quick solutions and mentors for further improvement. Official Photoshop discussion forum by Adobe. Dedicated photoshop forums for each topic on photoshop. Ask a question to the creators of Adobe Photoshop. There are hundreds of impressive ways to create text effects using Photoshop. Here is a huge collection of free tutorials on text effects. Create a realistic emboss and deboss text effect with this awesome guide. Create a Yummy Cookies Text Effect in Photoshop Create a delicious text effect with just some simple steps and tricks! Create an Eye-Catching 3D Tech Style Design your text in a new and techno way, making it more impressive and giving it a sophisticated look. Create an Extremely Glossy Text Effect Add a little glamor to your text, making it appropriate even for a glossy magazine. Creating a Tron Legacy Text Effect Make a ‘Tron’-like text effect that will surprise everybody and even confusing some of them. Create an Awesome 3D Text Effect using Photoshop Learn the basic ways of text manipulation together with this simple tutorial in which you will create an amazing 3D text. Create a Festive Ornamental Text Effect Create an impressive 3D effect for your text together with this amazing tutorial! Logo Design Process and Walk Through of Design Make a beautiful nature-inspired text effect that will look awesome and unusual. Create an Ice Cream Type Treatment Here you will create a tasty text effect, yummy! Create a Burning Text Effect Make a powerful and intensive burning text that will surely grab all the attention. Create a Dawn of War Style Effect With some intuition and knowledge, you’ll be able to create a beautiful and impressive text with a look as it was the witness of a true war. Create Typography Poster Enigma Design a text effect with a mysterious air and great surroundings, probably an impressive text effect that can attract people’s attention. Create a 3D Arcade Text Effect Using Photoshop In the following tutorial you will be guided to create a 3D arcade text effect using Photoshop and a little bit of Illustrator. Design an Elegant Glassy 3D Typography in Photoshop With a cold and elegant look, this text effect is great for a techno style project! Text on Fire Effect in Photoshop Make another version of the fire text with a clearer look. Make a Grungy Metal Text Effect Great for graphics with a futuristic look, this text effect may be the key to creating a perfect futuristic feeling for your graphic. Create an Inception Poster Repousse Such an effect may look hard at the first place to make, but it’s easy and the impact done on the viewer is greater than you would expect! Create a Take Break 3D Text Composition Control an amazing energy splash with this tutorial which teaches you tricks to create such a groundbreaking text effect. Woodcut Typographic Illustration in Photoshop Create a very unusual yet artistic text effect with this quality tutorial! Make a Cracked 3D Stone Text Effect in Photoshop Design this realistic text effect that will surely amaze everybody, as it looks like it’s blending with the entire world, making it more interesting and original. Create a Revolution Artwork Text Effect Lighten your works using this awesome text effect that draws all the attention to it and glows like a great star in a dark sky! Creating of a Pipe Typography in Photoshop Create an unusual and interesting text effect using simple pipes and drains. I’m impressed by its funny yet realistic look and feeling. Create a Harry Potter Style Text Effect Make a Harry Potter text effect in just a few steps! Here you will find out tips and tricks on making it. Making of a Chrome Emblem Shiny and interesting, this text effect allows you to create some beautiful car logotypes for your creation. Design a Super Glossy 3D Typography Effect A text effect that has an artistic look with realistic detail. Impressed by its shiny and glossy effect. Make a Modern 3D Text Effect Make an interesting and modern look 3D text that is worth using in different works. Create a Retro Sci-Fi Movie Poster in Photoshop A text effect with sci-fi feel that can create a perfect mood for sci-fi related poster. Design a Skin Textured Typography Scene It may look a little bit scary at the first glance, but this is a worthy text effect thanks to its unusual and charming look. Making of a Cool Text Effect Puppet Warp Tool Manipulate the ropes as you want to create amazing and realistic text effect that definitely looks awesome and attractive. Learning Photoshop can bring the artist out of you and you can create images that can bring out your creativity. Above everything else, you can edit images and get paid for the job you love to do. Keep learning to grab the jobs available in the media and advertising industry. Updated October 2016: Fixed broken links, added more tutorials and courses to the list. Updated December 2016: Fixed minor issues and added more tutorials link. Updated May 2017: Fixed broken links and added more tutorials link. Updated Jan 2018: Fixed broken links, added more tutorials and courses to the list.